Virginia is nicknamed "Mother of Presidents" because eight of the U.S presidents were born here, more than any other state. This state is also the home of a large number of lawyers who are very experienced and qualified and can represent law areas such as bankruptcy, divorce, child custody, alimony, and more. Virginia played an integral role in the civil rights movement; as the state’s segregation and anti-miscegenation laws were overturned, citizens across the country began to enjoy opportunities and freedoms they had never experienced before. Virginia has also attracted attention for its corrections policies, which someday may serve as the impetus for criminal justice reforms nationwide. The Virginia case of Davis v. County School Board of Prince Edward County was at the heart of the civil rights movement. Davis was one of four other cases that were heard in Brown v. Board of Education, in which the U.S. Supreme Court barred racial segregation in public schools. The Court’s decision was met with great hostility by many white Virginians, and the state continued to segregate its schools for a number of years. Another Virginia case, Loving v. Virginia, served a historic role in the civil rights movement. In this 1967 case, the U.S. Supreme Court struck down the state’s Racial Integrity Act of 1924, which prohibited persons from marrying outside their race. In a unanimous decision, the Court found that Virginia’s statute violated the Fourteenth Amendment’s Due Process and Equal Protection Clauses. Loving made all race-based marriage limits unconstitutional and paved the way for future laws which have expanded the definition of marriage. Although anti-miscegenation laws were not enforced after Loving, they were not completely abolished across the states until 2000. Virginia is also known for its strong death penalty law. Virginia was the first state in the nation to impose the death penalty when it hung George Kendall in the early 15th Century. Since that time, Virginia has executed the most prisoners of any state in the country, over 1,300. Since 1972, when the U.S. Supreme Court reinstated the death penalty in Gregg v. Georgia, Virginia has executed the most prisoners besides Texas. According to a recent study conducted by the ABA Commission on Racial and Ethnic Diversity in the Profession, approximately 20% of Juris Doctorate degrees were awarded to minority students in 2003. And according to recent Martindale-Hubbell statistics, there are over 100 civil rights lawyers practicing in Virginia. Virginia is home to a large number of experienced and qualified Virginia lawyers. These attorneys can represent you in many diverse areas of law including personal injury, bankruptcy, automobile accidents, tax, DUI, arson, assault, divorce, child custody and alimony issues, and more. There is a General District court in every city and county in Virginia and these courts decide all criminal cases involving violation of laws. General district courts in Virginia also decide all civil cases in which the amount does not exceed $25,000. 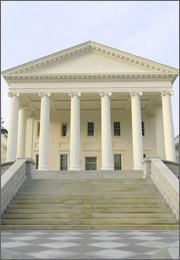 Traffic cases are also heard in the General district court of Virginia. Decisions that are made in the General District Courts of Virginia can be appealed to the Circuit Court. The Circuit courts also hear more serious criminal offenses and civil claims that exceed $25,000. LegalMatch.com is an efficient and free way to find a pre-screened lawyer. LegalMatch has exclusive access to a wide variety of lawyers who practice many types of law, including constitutional law and criminal defense law.